My friend Kazue is visiting from Japan, and her favorite food here just happens to be hummus. So I whipped up a batch or three. 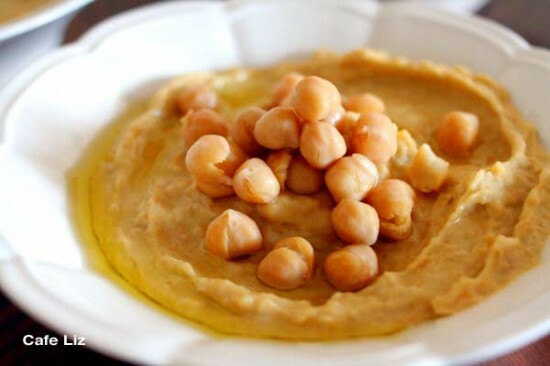 Hummus is quite possibly one of the simplest things to make, full of rich, creamy flavor — so long as you use fresh chickpeas. That canned stuff with the weird metallic aftertaste just isn’t as good. This requires a bit of advance planning, and a lot of passive cooking time. The chickpeas soak overnight, and then cook slowly on the stove. But don’t worry, you don’t have to watch them too closely. And then you’re pretty much done — just drain the water, and whir the beans with some olive oil, tahini and salt. 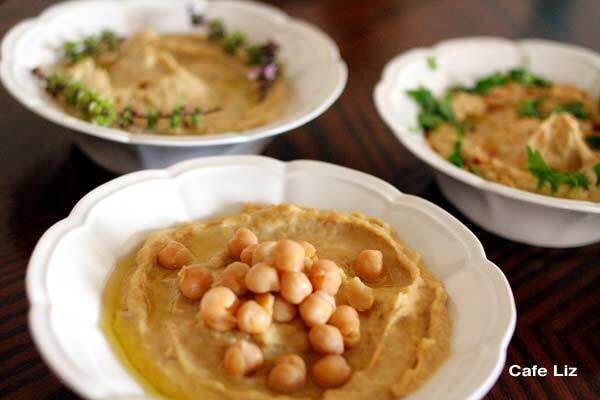 You’ll have the richest hummus you’ve ever tasted, on par with any of the hummus restaurants around here. And if you want that sour, slightly rancid taste that characterizes hummus purchased at the supermarket, in absurdly small containers? Don’t worry, just leave it in the fridge for a week or two. With that I should add: This is best when eaten right away. Don’t let it sit in the fridge for too long. Since I don’t like eating too much bread, I have my hummus with vegetable sticks instead. Set the chickpeas to soak overnight, with enough water to let them more than double in size. Dump off the soaking water, and put in a pot or a pressure cooker, covered in clean water. Cook for about 30 minutes in a pressure cooker or 1 1/2 hours in a regular pot. Drain the chickpeas, measure out 2 cups and blend with the olive oil, tahini and salt. 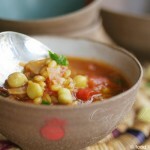 Serve with a drizzle of olive oil and topped with some extra chickpeas as a garnish, and to add texture. Blend with the basic hummus in the recipe above. Garnish with sprinkles of cumin and paprika, and an extra drizzle of olive oil. Blend a few basil leaves with the basic hummus recipe, and add a few more as a garnish (I used basil flowers, since my basil insists on producing them, anyway). 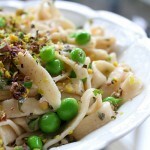 A sprinkle of chopped parsley leaves, a sliced hard-boiled egg, dried sumac, zaatar, toasted pine nuts. 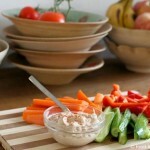 7 Responses to "Super-fresh hummus"
I haven’t managed to successfully do this, but if you sprout them, it should cut down cooking time to ~20 mins. Haven’t heard of anyone who does not like hummus. I make different kinds, but the basil one sounds really good. i always pressure cook the c.peas. What is your opinion on de-skinning the chickpeas once cooked? I have made lovely hummous from chickpeas from a glass jar, and also find that the quality /ammount of tahina (some are way too strong) affects the end result. I don’t think you need to skin the cooked chickpeas. You could remove any stray skins floating in the water, but beyond that, I think you’re just creating unnecessary work. Regarding the tehini, definitely taste-test as you add — best way to get the end result you want. Light or white tahina is not as strong as dark tahina so that might work better for you. The difference is that the dark version contains the whole sesame seed whilst the seeds in the light version have had their skins removed. I love hummus and miss Israel so much! Hi Rhona, that’s interesting. I’m not sure I’ve ever seen tahina marked as light or dark — the only dark tahina I’ve had was black from ground ketzah. I wonder what we’re eating here.